Pétanque, the French game of boules, is rapidly gaining popularity in New York City. The evidence is not only in the constant buzz of activity at the Bryant Park Pétanque Courts, located near 42nd Street and 6th Avenue, but in the recent media buzz surrounding the area, the game, and its dedicated players. 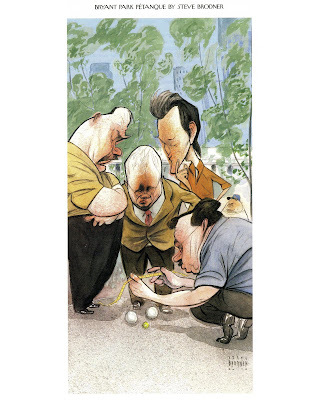 Flip to page 42 of the August 2, 2010 issue of The New Yorker, and you'll find a gorgeous illustration of Bryant Park Pétanque players by cartoonist Steve Brodner. Ernesto Santos, President of La Boule New Yorkaise, the award-winning pétanque club that provides free lessons in Bryant Park, was profiled by Erasmo Guerra in the article Latinos make a pitch for French-game pétanque for the New York Daily News. Shortly after, NPR aired a story by Margot Adler about Bryant Park Pétanque on the program All Things Considered, which you can listen to right here. Both pieces emphasize how the game of pétanque, especially when played at the Bryant Park Courts, creates a sense of community among people of all ages, nationalities, and professions. Drop the park on weekdays from 11am to 6:30pm for a free lesson, or contact us to organize a Pétanque Party for your friends, family, or coworkers...just don't call it bocce!